Professor Sir Tim Berners-Lee, the British computer scientist best known as the inventor of the World Wide Web, has been awarded an OII Lifetime Achievement Award in recognition of his pioneering role in proposing and creating the basic building blocks of the Web. 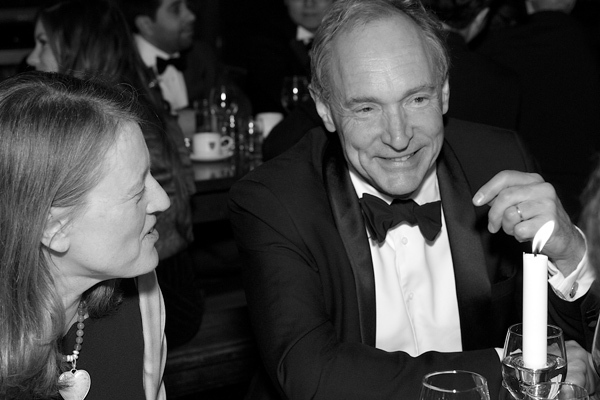 Sir Tim Berners-Lee, recipient of an OII Lifetime Achievement Award; OII Director Helen Margetts at left. In 1989, while working at CERN, Sir Tim Berners-Lee proposed a global hypertext project, to be known as the World Wide Web. Designed to allow people to work together by combining their knowledge in a web of hypertext documents, he wrote the first World Wide Web server and client. The program “WorldWideWeb” was made available on the Internet at large in 1991 and his initial specifications of URIs, HTTP and HTML were refined and discussed as the Web technology spread. In 1994, Sir Tim founded the World Wide Web Consortium, a Web standards organization that develops interoperable technologies to lead the Web to its full potential. Sir Tim is a Director of the World Wide Web Foundation, started in 2008 to fund and coordinate efforts to further the potential of the Web to benefit humanity. He is the Director of the World Wide Web Consortium a Web standards organization founded in 1994 which develops interoperable technologies (specifications, guidelines, software, and tools) to lead the Web to its full potential. He has promoted open government data globally, is a member of the UK’s Transparency Board, and President of the UK’s Open Data Institute. Together with Professor Nigel Shadbolt, he is one of the key figures behind data.gov.uk, a UK Government project to open up almost all data acquired for official purposes for free re-use. In December 2004, he accepted a chair in Computer Science at the School of Electronics and Computer Science, University of Southampton, England. In 2004 he was knighted by Queen Elizabeth II for services to the global development of the Internet, and was one of five Internet and Web pioneers awarded the inaugural Queen Elizabeth Prize for Engineering in 2013 for “ground-breaking innovation in engineering that has been of global benefit to humanity.” He is a Fellow of the Royal Society, and a Fellow of the American Academy of Arts and Sciences. He received a first-class degree in physics from The Queen’s College of the University of Oxford in 1976. The award was presented on Friday 7th November in Oxford, at an awards dinner and ceremony that also includes Lifetime Achievement awards for Professor Barry Wellman and Dame Stephanie Shirley.